Tecmo brought this game out in 1993 in Japan, and 1995 in the US. This game is a prime example of not understanding the language making the game more interesting. The game itself has a pretty bad English translation, and the sprite work definitely isn’t more amazing in the Japanese version. Still, there’s some confusing sprite changes that give it a bit of mystery. An awkward "damages" isn't the worst part of the translation. As for the plot, the actual plot of the game is pretty simple. Problem is, it’s so poorly translated that reading between the lines makes it feel like there’s more depth than there probably actually exists. For example, your party are Aqutallions. The four children are all adopted kids with psychic powers and strange temples that wait for them. Once you’re awakened, you’re a Pennon. If you win your test at the temple, you’re a Banalet, and when they’re all together, you’re an Aqutallion. The children gather together other children that are from other towns. You can find a mad scientist who’s doing experiments on children, and most adults in the game are corrupt or useless. David, the first Kustera, waits in this house. You’re helped by one team of adults. They’re the Kustera – a fated team of adults who work beside the Aqutallions. Most of them have implications of being outcasts or having feelings of dissatisfaction with how the world works. For example, David is a wandering warrior who people describe as “strange” and who is looking for the hero to work with him. Ben’s an alcoholic priest, who is only drawn out of his drinking by the party. This is a typical censored sprite change. This bar above Ray is a "coffee" shop in the US version. Alas, the kids versus adults plot is mostly non-existent or implied. The Kustera have maybe a line or two of back story that’s usually incomprehensible. 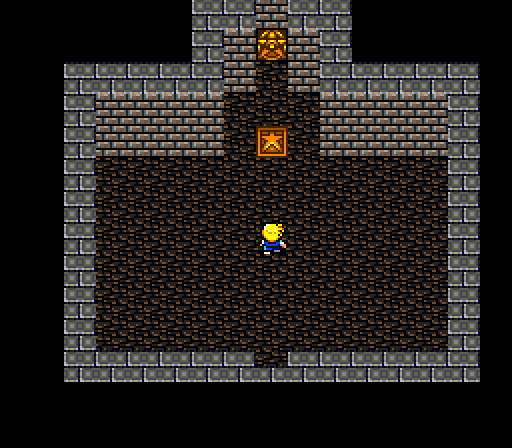 The graphics are simplistic, and the music is bloopy and grating. The actual plot mostly involves fetch quests or dungeon crawls to get to bosses leading to another fetch quest. For example, Cody is a potential Aqutallion. However, he’s kidnapped from his home by evil. They turn him into a lion and were going to show him off at a circus, but the party works their way to him. However, the evil general flees with him. On the way to trace the general, you have to get a mustache that can turn a man back from being a gold statue. (This makes as little sense as it seems.) By “swinging” the mustache, Kaja’s turned back to normal. Well, when you find the lion, he’s been turned to gold. Kaja turns him back to a lion, and then your holy crests at your home town are enough to turn him into a human again. The stars were changed to plus sign like shapes in the US version. The world map is huge and there’s a pretty large floating continent. There’s four vehicles, not counting uncontrollable ones. You can auto battle, and turn off battle animations to speed up battles. You can see weapons in said battle animation. This is pretty ambitious, but the execution is so poor that it’s unpleasant to play. Really, if the game was faster and less repetitively fetch quest filled, it probably would be pretty interesting. 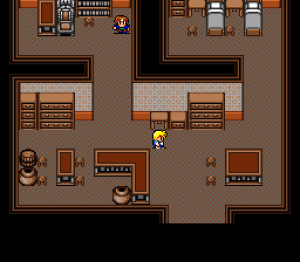 The father of the hero's sprite in the US version. And now the mystery. The sprites for the dad were changed in the game. Since there’s some mysterious mentions of the evil boss (Homncruse / Homunculus ) is torturing the father, it could have been changed because it looked iffy in a later scene. It could be that the father looks too much like a young woman with pigtails. The Japanese version of the same scene. 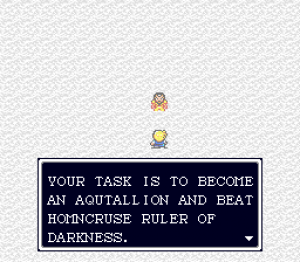 All in all, Aqutallion is still an awful game, and I’m sure the changed text is absolutely no more exciting than the translation. Still, the language barrier makes the changes curious. I have a feeling that Ray’s father was actually his mother in the Japanese version. Via some babelfishing, it sounds like the plot is almost identical. Of course, that doesn’t prove anything. 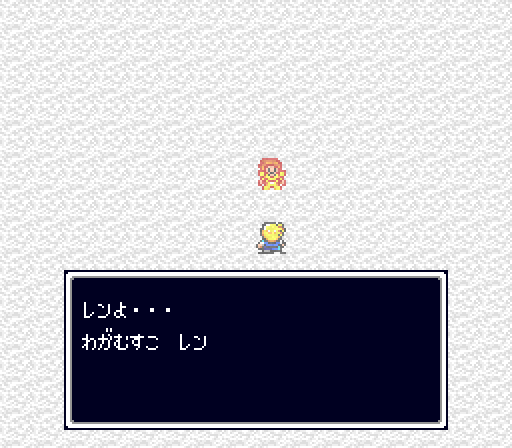 I half suspect that the “father” sprite is supposed to look like the hero, grown up, in some weird golden armor. It’s a weird sprite either way. There’s a few other changed sprites I noticed in the early game, but they’re mostly unremarkable. I do wonder if the later scenes where you rescue children from a research facility had different dialogue. It seems rather random in the game. You’re welcome. I’m still hoping for a re-release of that game with a better translation. Well, there are 2 things I do not like about the game- one is in fact the use of 2 separate parties, the Aqutallion and Kustera, and the 2nd reason is the translation. 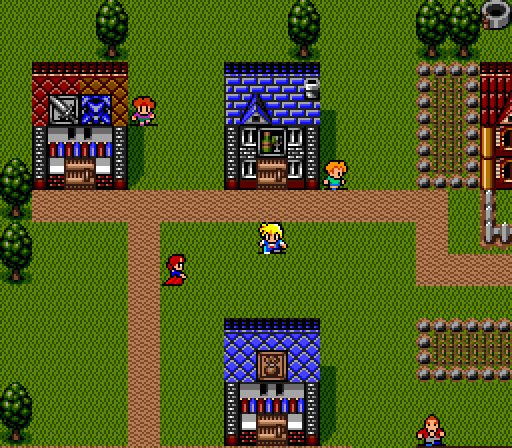 In all honesty, I feel that Tecmo should’ve done a better job with this game like what they have done with Radia Senki. But all in all, I like the game, its music and its battle system. I find it to be a great game in my eyes, better than the famous and well known games that always get a perfect score by reviewers and game magazines. Reviews do not make or break a game- it is the actual mechanics of the game itself, such as its gameplay, music, etc. 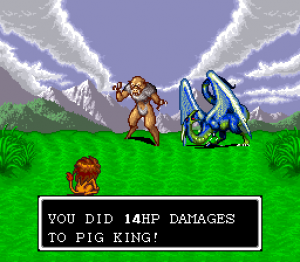 There is some sort of inspiring antiquity that makes this game seem like a gem now as opposed to back when I first played it in ’98 the game is a rpg for it’s time in the since that it is turn based and quest driven albeit that the game does not help the protagonist along on the quests to much at times and it calls for a lot of searching talking to npc’s and grinding for levels at points but i have to say that if you go into the relationship with the game with a mindset of 1993 the rpg value of the game increases since that was over 20 years ago dragons quest, paladins quest, soul blazer (epic game of the time not mentioned a lot), Ultima *titles* and even the first breath of fire was around this time. When you look at those games they are similar for the time. The best RPGs of 93 to 95 were secret of mana, Illusion of Gaia, final fantasy 2, and Shadowrun! When you think of these games realize that there was BIG bucks behind them like square and enix which had already made ground way and could afford good programmers and graphic designers. I will say that the game has left much to be wanting but for those that want to shuck the graphical overcompensation and like a simpler RPG from the day this is it. Tecmo’s Secret of the Stars has some undeniably poor design choices. You have the search of the gold nail, which I remember Nintendo Power answering questions about almost to the start of the N64 era. You have the grinding. You have long winding dungeons. There’s charm to the bright colors, and there’s hints at a cool plot. The adults versus kids stuff is cool. The adults all having various problems and teaming up as a team could’ve had cool stuff – but you never have a reason to use the adult party. I’m glad you found looking back at the game to be great though? It’s nice to find something that you enjoy.